Planning a beach vacation involves a great deal of planning and thought. Once you connect with our experienced guest service agents and they pair you with the perfect community and property for your beach vacation, look here to find out more about our beach communities. From beach to bay and everywhere in between, North Florida offers miles of award-winning beaches with white sand, emerald blue waters all under beautiful sunshiny days. 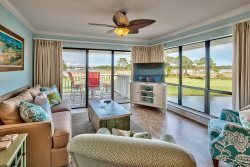 Whether you choose lounging on the beach, perfecting your tennis serve or taking one of the many championship golf courses, Russell Vacation Rentals is here to make your vacation a pleasure in every way. Along with the stunning landscape, a full array of activities caters to the adventuresome. A round of golf, tennis lessons with a pro, stand-up paddle boarding, or perhaps a full day of fishing – all await participation. Dining options are equally plentiful, from casual beachside restaurants to beautiful sunset dinners, Northwest Florida’s Emerald Coast has it all. In addition to the countless activities of Florida`s Gulf Coast, Destin and 30A offers a year-round list of annual events and festivals to experience. Whether you prefer a Destin wine festival, farmer`s market, fireworks display or music festival, you`ll find it here. Experience over 800 world-class wines each April at the South Walton Beaches Wine and Food Festival or rock out with 150 Artists in 25 Venues at the 30A Songwriter`s Festival each January. Athletes and Anglers come from all over the world to participate in fishing tournaments and races. Or maybe you are a fashionista or budding designer in which case South Walton Fashion Week is the event for you. With access to a variety of depths and even more unique coastlines, Destin is a haven for many anglers. The Gulf provides a sanctuary where many types of fish migrate the coast annually. The Choctawhatchee Bay offers marshlands, backwater, and many environments for shallow water anglers. Whatever your fish preference; chances are you`ll find it here. Not much of an angler yourself? Destin offers some of the best boat and dolphin tours in the area! Learn more about our top fishing charters and boat tours. Located within the Sandestin® Golf and Beach Resort, The Village of Baytowne Wharf™ offers guests of all ages an enjoyable place to find great food, shopping, entertainment and more day or night. Seasonal fireworks, outdoor movies, live music, holiday events, wine, food or beer festivals and more are just a few of the options awaiting at The Village of Baytowne Wharf. Located on the Bayside of the resort, be sure to visit the Baytowne Marina for a beautiful sunset or early morning walk along the Choctowhatchee Bay. You`ll appreciate the selection of over 10 private and public golf courses in and around South Walton and Destin Florida. At the heart of your golf vacation is the Sandestin resort which offers a selection of fun activities including tennis, retail shops, restaurants and nightlife. Known for the most beautiful, white-sand beaches around, the beaches of South Walton are the perfect location for your families getaway! The Destin area was named one of the 10 Most Beautiful Places in America by Good Morning Ameria! Miles and miles of pristine beaches await, where the motto "leave no trace" is enforced with pride and with the idea of always looking ahead to preservation. et in an idyllic beach locale complete with picturesque cobblestone streets and exquisite wines ready for the pour, Rosemary Beach Uncorked will celebrate its 9th year in 2019. Taste the very best of food and wine Rosemary Beach has to offer with featured restaurants, countless bottles ready for the pour and a rockin` band performing live throughout the festival.